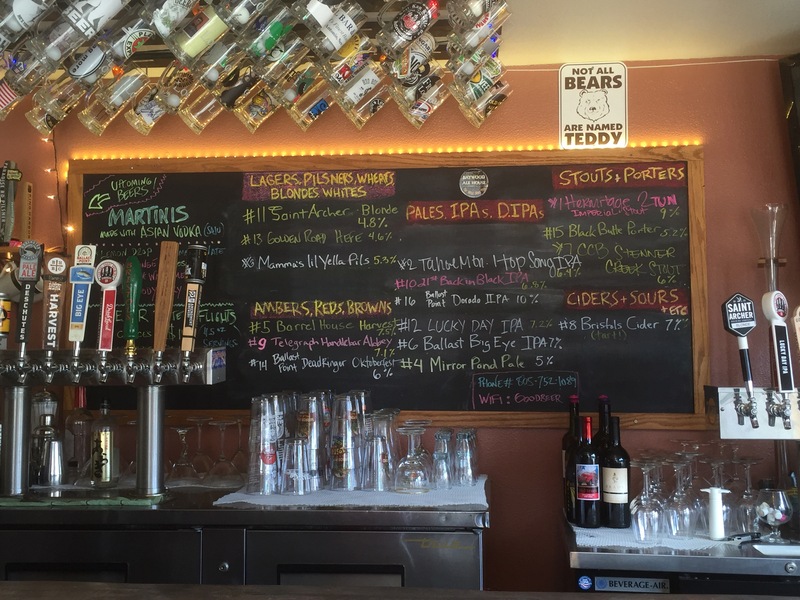 On my irregular visits to visit my mom I always find time to have a pint or two at the Baywood Ale House. This is the off season and I am stopping in on a very quiet Wednesday afternoon. It is so laid back and that suits me well! 16 taps and an obvious absence of the big boys. Sorry, you can’t get a Bud, Coors or Miller beer. Ya gotta love it! Let me tell you a story about the photo above. Chalk board is pretty obvious, brews available! A new change for me though- last visit they were arranged seriatum by tap position. Now, the are arranged by type. Overhead are mugs for the locals. I love how they manage the slackards – every Monday a ping pong ball is dropped into the mug. When you visit and order a beer the ball is removed and you are out of jeopardy. If on Monday there are three balls in a mug you lose. There are 350 on the waiting list! Next in line goes up! The martinis, yes they make martinis too. All are made with an Asian Vodka, “Soju”, not on my list today! Sorry! Music? Just listened to Fly Leaf …….. I like! Yes they have food too along with wine, bottled beer and other stuff”! 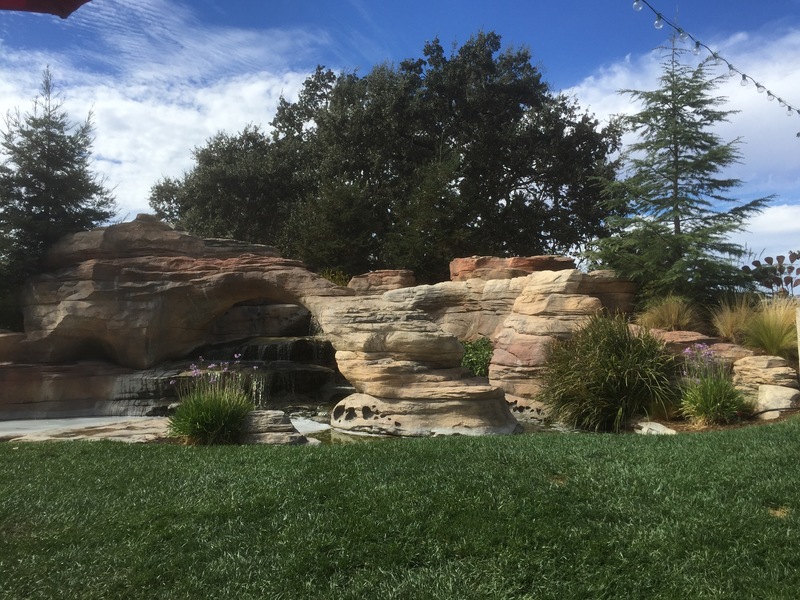 If you are cruising north or south on Highway 1 take a diversion to Baywood – Los Osos and indulge! Sure wish my wife was with me, love you Hun! I will be home the day after our after our 33rd. I took a drive yesterday from Bakersfield, California over to the small town of Los Osos, California to visit my mom. 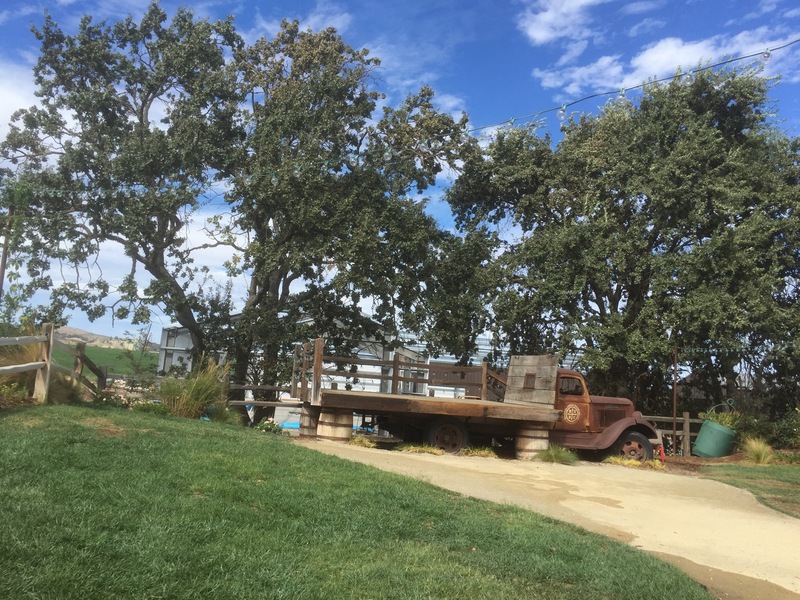 The trip took me through Paso Robles and dang it, right by two of my favorite breweries! Firestone Walker is well known all across the national craft brewing world but I chose to bypass it and run by my other favorite, Barrelhouse Brewing Company. I waved as I drove by and promised to stop when I have more time…. Next trip. Beautiful day and the grounds are just a great place to kick back and enjoy their great beers. The old flatbed is used on the weekends as a stage for live music. I have enjoyed a beer with a band playing on a previous weekend visit but today’ mid-week was quiet with just a hint of Highway 101 traffic in the distance. Fittingly masked by the sounds of the waterfall and pond on the grounds. I wonder if I could put up a tent and camp out? I behaved myself and limited my intake to just two beers, the Templeton Session Ale and the Barrel House Blonde. The session ale was very nice and almost as good my home brewed session ale. The Blonde is one my wife has enjoyed and I drank it thinking oh her……I really did Hun! 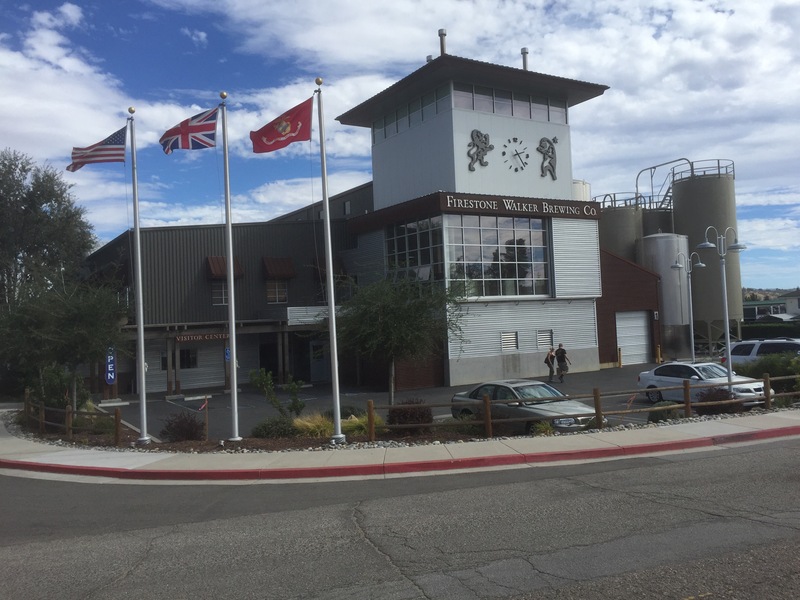 Next time you pass through Paso, stop by Barrelhouse Brewing Company! Today is brew day! I made the switch to All-Grain brewing almost two years ago. It takes time! On top of that this recipe calls for a 90 minute boil! To pass the time I made some labels for my Session IPA. The bulk of that batch went into my 6 Liter mini kegs from Tap-a-Draft. 12 liters kegged and about 16 bottles. Labeling is a good thing because I sometimes discover an orphan in the back of the fridge and have to drink it to find out it’s lineage. Oh Darn! Session IPA – Ready and waiting on thirsty lads. Over ninety degrees F in my outdoor brewhaus- proper attire, sandals, shorts and a t-shirt! Killing two birds with one shirt….. Thanks Hun! should come in under 20 IBU. My daughter Lisa participated in the Island Girl Tri, sprint triathlon, on Galveston Island this past weekend. 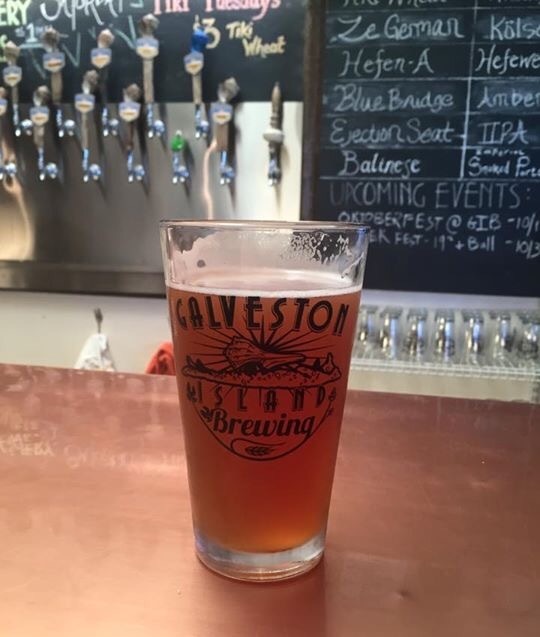 Post event, it was rehydrate time and what better place than Galveston Island Brewing. The board was full, 12 beers, so little time and so far to drive! 72.1 miles and about 1 hour and 28 minutes, depending on traffic. Need to find another excuse to make the drive to the Island. Lisa asked me to bring some of my honey, honey from my hives, down to the event. 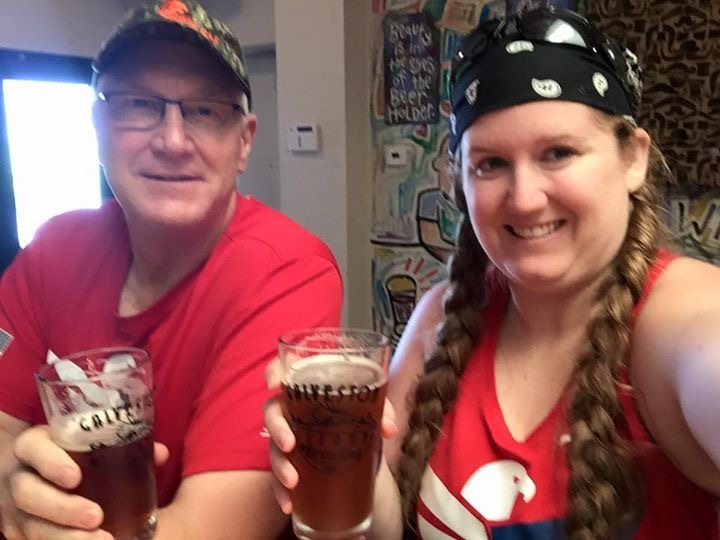 A number of her running mates with Team RWB, “Team RWB’s mission is to enrich the lives of America’s veterans by connecting them to their community through physical and social activity.”, were in attendance and were seeking some Raw local honey. We were well prepared but we failed to make the connections at the event. So, I had plenty of supply when we arrived at the brewery. We were first in the door on this Sunday noon! There was another triathlon participant and her date joining us for the first beers of the day. She, the young lady, was a brewer and prefers stouts and porters. The crowd began to trickle in and to our right was a couple, Tanya and Greg. Somehow the conversation got around to raw honey and specifically, creamed honey. Well, we just so happened to have a supply. Tanya and Greg bought a pound jar of honey and a 3/4 pound jar of the creamed honey – cinnamon flavor. Charday and Dave showed up a little later, they had worked the beer stand at the triathlon event down at Moody Gardens. She was intrigued and bought a jar of the creamed cinnamon honey…….she popped the top off and uttered that Mmmmmmm sound of enjoyment…she couldn’t wait. Lisa rehydrating with the Citra Mellow IPA and I had the Blue Ridge Amber Ale. Due to our early visit we were treated to a taster of the Amber Ale straight directly from the fermenter after the brewer added wet Mosaic hops….it was very yummy. I need to make a visit in a couple of weeks when it is finished and kegged. This is such a friendly place…reminds me of the atmosphere of the little village Gasthaus in the village I lived in in Germany. Something about drinking beer gives you automatic admission to the fraternity…Now, to rankle some feathers, I don’t get the same feel in a wine room or wine bar…just saying! Lisa’s Citra Mellow before rehydrating. She followed it with the Oktoberfest. So, I think it was Beer and Honey, this time….but you never know when opportunities crop up. The lesson for me….I will carry a stash of my honey…great ice breaker to make new friends and maybe, make a little beer money! I have put back 5 pounds of a dark rich honey collected from my bees. I have been planning to make a beer utilizing my honey but haven’t made the time, until now. I asked my Honey for input, as we tend to like different styles….this beer is for her! In her cute way of saying it….A “Honey Ale”, I have translated that to a “Honey Blonde Ale”. Now comes the daunting part….selecting a recipe. There are so many choices! This will be an all grain batch targeting an IBU number of around 20…..again, this is for my Honey and she prefers beers on the lower end of the IBU scale. The challenge is add the honey in such a way as to not completely lose it’s flavor completely. Obviously, it should be added at or near the end of the boil. Research also shows opportunities to add some honey to the secondary….Hmmmmm – I continue to do my home work. I have a bit of time to plan…I won’t brew this batch until the eye doctor give me permission to lift loads heavier than 20 pounds. I am having cataract surgery in a couple of days and would hate to lift a 5 gallon fermenter and have the implanted lens pop out….. Maybe I can draft my eldest son, a little over 6’5″ and now outweighs me and has the benefit of stupid young man strength, to help me out! PS – after challenging me to arm wrestle on his 21st birthday and losing badly – I still maintain a bit of a fear factor over him…it keeps him in line! He is now 25 and hasn’t asked for a rematch. Brew date is toward the end of the week of September 14. I do treat my son well….on the right is a Session IPA….his favorite and on the left is the “Yes Dear Raspberry Wheat Ale”….a little left for my wife. Brewing notes will be forth coming, in less than a fortnight!